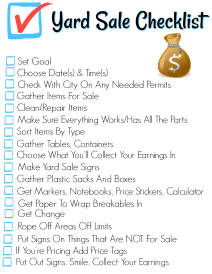 You are here: Home / Family Living / 10 Yard Sale Hacks That Everyone Needs to Know! People love yard sales for several reasons; some love the thrill of the hunt, while others love making money selling items they don’t use anymore. Regardless if you are an avid yard sale buyer or seller, there are a few yard sale tips & tricks that you should know before going to or setting out those yard sale signs, or even moving sale signs. 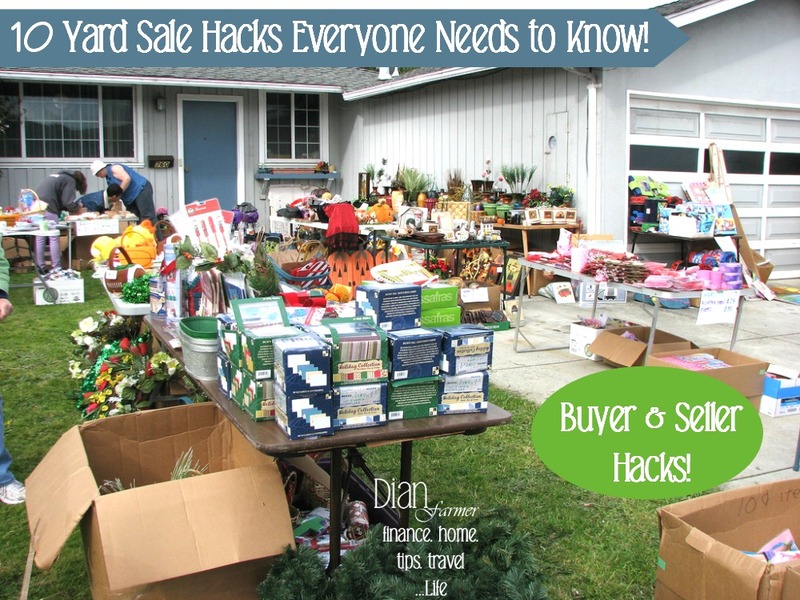 Below you will find 10 yard sale hacks and garage sale tips for buyers and sellers that will not only help you get the best price when you are buying, but also sell for the best price when you are selling. There is power in numbers! If there are several items that you are interested in at a yard sale, ask the seller if she would make you a deal on all of the items together. Sellers want to get rid of their stuff and the more stuff you buy, the better deal you can get. For example, the last yard sale I went to, I was interested in some framed prints priced at $5 a piece. I picked up 3 of them and asked the seller for his best price on all 3..he said $10 bucks! I saved $5 just by asking for a bundled price! Text book flipping can be a lucrative side hustle, especially if you are in a college town. Download the BookScouter app onto your mobile device before going to a yard sale. If you find text books at the yard sale, you can use the mobile app to scan the ISBN barcode to find out how much the book is worth on sites like Amazon, Half Price Books & Barnes & Noble. Textbooks are usually priced between $1- $5 at yard sales, leaving room for some major profit! You know how the old saying goes, “The early bird gets the worm” ..well in yard sale talk it’s “The early bird gets the deal” You’ll want to scope out the yard sales online or in the paper ahead of time, choose the one that looks the most promising and be there as soon as it opens. There is no shame in creeping up to the driveway early and scouting out the sale from your car. Getting there early means you’ll get first dibs on the good stuff. Now I know I just told you to get there early in the morning in the last tip, but there is also a strategy in going right before the yard sale shuts down as well. Sellers are more willing to slash prices as the sale is coming to a close. I’ve even seen some sellers start to give stuff away for free in the final minutes. Visiting yard sales just before closing can help you score on some potentially free or cheap stuff! You’ve heard of a poker face, right? Well that’s the kind of face you’ll need to put on when you spot an “oh my gosh, I must have it” item at a yard sale. Sellers will be able to sense your excitement and be less willing to negotiate on the price. If you do see an item that you absolutely must have, try to negotiate a lower price even though you’d be willing to pay full price for it. It doesn’t hurt to ask. When advertising a yard sale online, Craigslist is probably the first website that comes to mind. However, there are several other garage sale specific websites that allow you to advertise your sale for free. Did you know that you can advertise your sale on YardSales.net (http://www.yardsales.net) and it will be broadcast out to 6 different garage/yard/estate sites and will also be emailed to thousands of their local email subscribers? This is a great way to advertise a sale to a wider audience! Not putting price tags for garage sale items on your larger items will prompt buyers to ask you how much the item is, to which you can reply, “I don’t know…how much are you willing to spend?” If you let the buyer start the price bidding, you could end up with more than you were going to ask. This is a great strategy for furniture, tools and electronics. If it’s a hot day, throw some bottles of water and cans of soda in a cooler and sell them for $1 a piece. This hack is a win/win because your customers are refreshed and you make a little extra money. Bonus Tip: If you have children, set them up with a lemonade stand at the beginning of the yard sale. Customers won’t be able to say no to cute kids! I’m sure you’ve heard plenty of stories about people finding treasures at yard sales because the seller had no idea of the item’s value…don’t let this be you! Doing a little online research into what your stuff might be worth is time well spent. This can especially be valuable for collectibles, electronics and vintage items. Check out Ebay’s closed listings or Craigslist postings to see what people are buying and selling those items for. Knowing what your stuff is worth will give you some leverage when negotiating with buyers. People love a good deal and can rarely resist a buy one get one free deal! Use the buy one get one free tactic on things like books, records and kids toys. This will entice people to buy these items because they think they are getting a good deal! Think about investing in a few signs, instead of the cardboard that gets blown away or ripped. Check out some of the best yard sale signs here. Are there any hacks we missed? 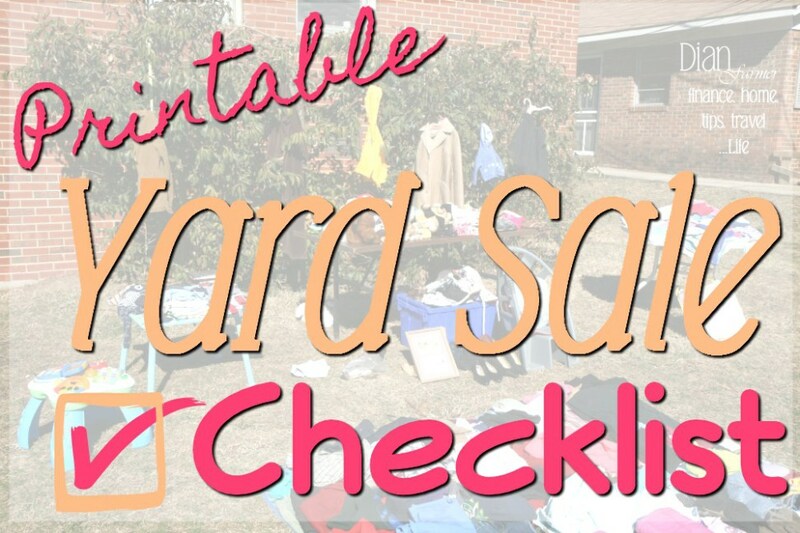 Feel free to leave us a comment with your favorite yard sale tips! I would like to add a very important tip… Start saving your plastic grocery bags. It makes it easier for customers to carry their purchases. And to wrap some items that you may not want to break. And an easy way to get it of the ton of them you already have. Great! 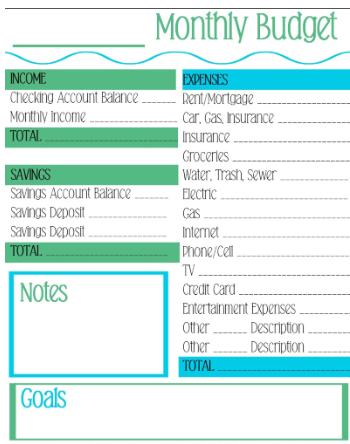 I love those ideas – so simple, yet, something easy to forget!